With its rolling green hills and replica European churches, Forest Lawn feels more like a fairy landscape than a traditional cemetery. Though some of old Hollywood's elite—Lauren Bacall, Humphrey Bogart, Clark Gable, Sammy Davis Jr. and Mary Pickford—are interred in areas closed to the public, you can pay your respects to cultural luminaries like L. Frank Baum, Elizabeth Taylor, Michael Jackson and Walt Disney. Step inside of the free hilltop museum and you'll find an impressive stained glass collection alongside temporary exhibitions, everything from the Old Masters to contemporary poster artists. 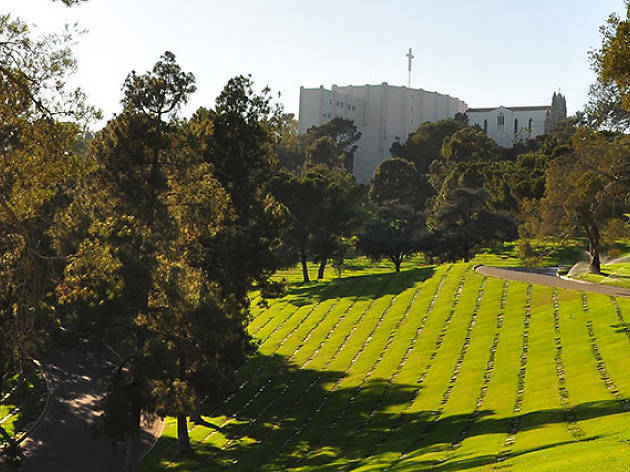 I never thought I'd be particularly drawn to a cemetery, but Forest Lawn is an exception. The rolling hills are gorgeous, and the museum and churches on the grounds are beautiful buildings to walk around. It's a little easy to get lost here, with winding roads that crisscross the grounds...but wherever you end up, the views and serenity will be quite welcoming. 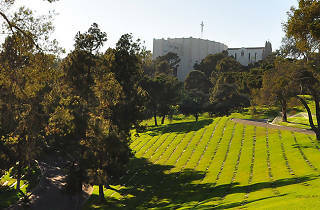 Hollywood Forever may grab all of the attention, but you'll find way more Hollywood history underneath the ground here. Come here for the museum at the top of the hill, which boasts some pretty unique exhibitions and fantastic views. The European replica churches are at least worth driving by.